Definition: Anorexia, also known as Anorexia nervosa, is a psychological and potentially life-threatening eating disorder. It can affect anyone of any age, gender, or background. As well as restricting the amount of food eaten, they may do lots of exercises to get rid of the food eaten. Some people with anorexia may experience cycles of bingeing and then purging. Anorexia isn’t really about food. It’s an extremely unhealthy and sometimes life-threatening way to try to cope with emotional problems. When people have anorexia, they often equate thinness with self-worth. Additionally, women and men who suffer from this eating disorder exemplify a fixation with a thin figure and abnormal eating patterns. 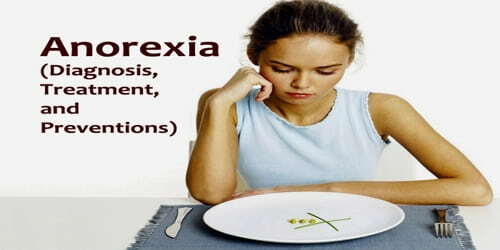 Anorexia nervosa is interchangeable with the term anorexia, which refers to self-starvation and lack of appetite. The exact cause of anorexia is unknown. As with many diseases, it’s probably a combination of biological, psychological and environmental factors. Anorexia is more common in girls and women. However, boys and men have increasingly developed eating disorders, possibly related to growing social pressures. There are a number of signs of anorexia, but someone doesn’t have to have all of them to be suffering. It’s not always obvious that someone has an eating disorder – remember, they are mental illnesses. If a person with anorexia becomes severely malnourished, every organ in the body can be damaged, including the brain, heart, and kidneys. This damage may not be fully reversible, even when the anorexia is under control. This eating disorder can affect males or females. However, 90-95% of those diagnosed are girls and women. It’s estimated that 5-20% of people affected by this eating disorder will die, with severity in relation to the length of time. Diagnosis and Treatment of Anorexia: If the doctor suspects that people have anorexia nervosa, he or she will typically do several tests and exams to help pinpoint a diagnosis, rule out medical causes for the weight loss, and check for any related complications. Other studies. X-rays may be taken to check the patient’s bone density, check for stress fractures or broken bones, or check for pneumonia or heart problems. Electrocardiograms may be done to look for heart irregularities. People with anorexia experience a deep fear of gaining weight, and will usually challenge the idea that they should. In most cases, anorexia can be treated in outpatient facilities. More intensive treatment in day patient and inpatient units might become necessary if the condition worsens if their health doesn’t improve in response to outpatient treatment, or there is another high risk to their physical health. Medical: The highest priority in the treatment of anorexia nervosa is addressing any serious health issues that may have resulted from the eating disordered behaviors, such as malnutrition, electrolyte imbalance, amenorrhea, and an unstable heartbeat. Nutritional: This component encompasses weight restoration, implementation, and supervision of a tailored meal plan, and education about normal eating patterns. The most useful therapy will vary from person to person and depend on circumstances. For example, family interventions are recommended as part of the treatment for children and adolescents. The therapy people are offered should take into account their preferences and those of the people caring for them where appropriate. Preventions: There’s no guaranteed way to prevent anorexia nervosa. Primary care physicians (pediatricians, family physicians, and internists) may be in a good position to identify early indicators of anorexia and prevent the development of full-blown illness. For instance, they can ask questions about eating habits and satisfaction with appearance during routine medical appointments. Anorexia is not a lifestyle choice—it’s an illness that slowly breaks down people’s mental and physical capacities. It’s out of the darkness that light appears and help is always available. A healthy, happy life is available for people and it begins with one step.